M.V. Lomonosov Moscow State University (Russian: Московский государственный университет имени М.В.Ломоносова, often abbreviated МГУ, MSU, MGU) is the largest university in Russia, and claims to be the oldest. Founded in 1755, the university has grown to be one of the largest institutions in the world and has a long reputation both in and out of Russia for its education and research facilities, especially in the areas of science and mathematics. Founded in 1755 by Mikhail Lomonosov, whose name was later added to the name of the institution in his honor, it was originally modeled after German universities with a largely German faculty. The university went through difficult times, as did Russia, with the prelude to the Revolution of 1917. After the revolution the university opened its doors to qualified students of all social classes, and efforts were made to assist those of the lower classes in attaining entrance qualifications. Subsequent political repressions negatively affected the development of scientific ideas, as Soviet scientists had virtually no contact with outside colleagues and only research compatible with Communist ideology was permitted. The institution again suffered difficulties due to the German invasion in World War II, but finally in the later part of the twentieth century solidified and expanded its position as a major academic force in not only Russia, but also Europe and the world. With a new charter adopted in 1998, the university has achieved not only substantial funding but a significant level of independence. In the twenty-first century, Moscow State University is expected to contribute greatly not only to the education of youth but also to the expansion of knowledge that will enable humankind to achieve a better quality of life. Moscow State University's 1998 charter established "democracy, openness and self-government to be the main principles in the life of Moscow University; the main goal is freedom to teach and to study as well as to develop oneself as a personality." This reflects the long standing tradition of Moscow State as being the most prominent higher education institution in Russia. It is disputed whether the Moscow State University or the St. Petersburg State University is the oldest higher education institution in Russia. 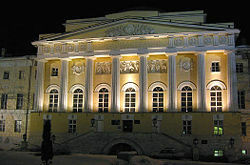 While the former was established in 1755, the latter, which has been in continuous operation under the name of university since 1819, claims to be the successor of the university established on January 24, 1724 by a decree of Peter the Great together with the Academic Gymnasium and Saint Petersburg Academy of Sciences. 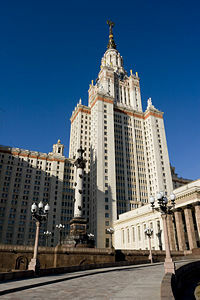 Moscow State University prides itself in its research facilities and projects, interdisciplinary programs in both the sciences and humanities as well as its high graduate and success rates. 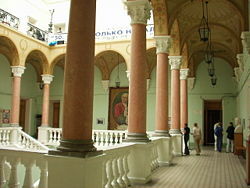 This reputation of excellence goes beyond Russia's boundaries; in 2007, the Moscow State University was ranked 76th, out of 500, of the best World Universities, and number 23rd in all of Europe. 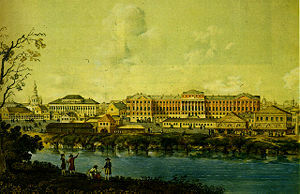 Main buildings of the university in the Mokhovaya Street, 1798. The university was established on the instigation of Ivan Shuvalov and Mikhail Lomonosov by a decree of Russian Empress Elizabeth dated January 25, 1755, which is still celebrated as Students' Day in Russia. First lessons were held on April 26. Originally located in the Principal Medicine Store on Red Square, the university was transferred by Catherine the Great to the present Neoclassical building on the other side of Mokhovaya Street. The main building was constructed between 1782 and 1793 to a Neo-Palladian design by Matvei Kazakov and rebuilt after Fire of Moscow (1812) by Domenico Giliardi. At this time the university had three faculties: philosophy, medicine, and law. In 1804, medical education was split into Clinical (therapy), Surgical, and Obstetrics faculties. 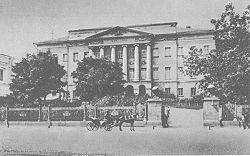 In 1884-1897, the Department of Medicine, supported by private donations, City Hall, and the national government, built an extensive, 1.6 kilometer long, state-of-the-art medical campus in Devichye Pole, between the Garden Ring and Novodevichy Convent. In 1905, a social-democratic organization was created at the university calling for the tsar to be overthrown and for Russia to be turned into a republic. The Tsarist government repeatedly began closing the university. 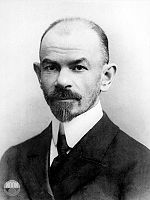 In 1911, in a protest over the introduction of troops onto the campus and mistreatment of certain professors, 130 scientists and professors resigned en masse, including such prominent names as Nikolay Dimitrievich Zelinskiy, Pyotr Nikolaevich Lebedev, and Sergei Alekseevich Chaplygin. Thousands of students were also expelled. After the October Revolution in 1917, the school began opening admission to all qualified applicants, not just those of the wealthy. In 1919, tuition fees were done away with, and a preparatory facility was created for children of the working class so that they would be able to pass the admission examinations. The political repressions of the 1930s and 1950s negatively affected the development of scientific ideas, as Soviet scientists had virtually no contacts with their colleagues abroad, while certain branches of science were condemned as based on the ideology alien to Communist ideas, and a number of scientists and scholars were sentenced to life imprisonment for their research efforts. In 1940 the university was re-named in honor of its founder Mikhail Lomonosov, coinciding with the beginnings of World War II, another difficult time for the university. During the invasion of Russia by Nazi Germany, academic studies were suspended and most of the school was relocated far from the war front, yet hundreds of students and professors stayed to join the army and fought to protect the capital. Many researchers at the university stayed as well, carrying out programs to aid the war effort. After the war, lawyers from the university played a vital role in the Nuremberg and Tokyo trials. During the post-war period the leading role of Moscow University in the restoration and further development of the country was fully recognized. There was a fivefold increase in the state funding, the new University campus was built on Vorobievy Gory (Sparrow Hills), where all the lecture halls and laboratories had the latest equipment available at the time. After 1991, nine new faculties were established. In 1992, a new charter was proposed and debated upon until 1998, when it was adopted. The result gave the university a unique status: it is funded directly from the state budget (bypassing the ministry of education) which provides a significant level of independence. Since 1953, most of the faculties have been situated on Sparrow Hills, in the southwest of Moscow. The Main building was designed by architect Lev Vladimirovich Rudnev. In the post-war era, Stalin ordered seven huge tiered neoclassic towers built around the city. The MSU Main building is by far the largest of these. It was also the tallest building in the world outside of New York City at the time of its construction, and it remained the tallest building in Europe until 1988. The central tower is 240m tall, 36-stories high, and flanked by four huge wings of student and faculty accommodations. It is said to contain a total of 33 kilometers of corridors and 5,000 rooms. Facilities available inside the building include a concert hall, a theater, a museum, various administration services, a library, a swimming pool, a police station, a post office, a laundry, a hairdresser's salon, a canteen, bank offices, shops, cafeterias, a bomb shelter, and so forth. Today, the Old Building housed Departments of Psychology and Journalism. Along with the university administration, four of the main faculties - Faculty of Mechanics and Mathematics, the Faculty of Geology, the Faculty of Geography, and the Faculty of Fine and Performing Arts - now remain in the Main building. The star on the top of the tower is large enough to include a small room and a viewing platform; it weighs 12 tons. The building's facades are ornamented with giant clocks, barometers, and thermometers, statues, carved wheat sheaves, and Soviet crests (recently renovated). It stands before a terrace featuring statues of male and female students gazing optimistically and confidently into the future. While the Sparrow Hills were on the outskirts of the city at the time of the construction of the Main building, they are now about halfway from the Kremlin to the city limits. Several other buildings and sports facilities were later added to the city campus, including the only baseball stadium in Russia. 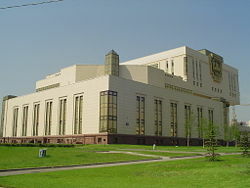 At the beginning of the twenty-first century, construction began on a new building for the social sciences faculties, and a vast new facility was completed for the library, which is the second largest in Russia by volume (number of books). The university also has several dormitory buildings in the southwest of Moscow outside the campus. The Moscow State University grants degrees in over fifty different areas of study, most of which fall into the humanities and science categories. In most of these areas, students are allowed to progress from undergraduate to the graduate and sometimes post-graduate level of study. In addition to Ph.D.s, the university also offers specialized medical and legal degrees. As the largest school in Russia, and excepting a large number of international students, the students at the Moscow State University make-up a diverse population. This gives many native Russians a chance to live with and encounter people from different cultures, ethnicities, and religions, sometimes for the first time. It also gives international students the opportunity to live in and explore the Russian culture. However, since the university is so large, there is also the drawback that going to school there can be at times an impersonal experience; with large classrooms and a campus spread out over a large geographical area, the sense of community can at times be strained. Located in the largest city in Russia, the university does give students the chance to live and explore Moscow, a modern cosmopolitan city full of history, culture, and excitement. Russian Students Day, (also known as Tatiana Day) is a Russian religious holiday observed on January 25 according to the Gregorian calendar. It is named after Saint Tatiana, a Christian martyr in second century Rome during the reign of Emperor Alexander Severus. In 1755 on the name day of Ivan Shuvalov's mother Tatiana Rodionovna, his mistress Empress Elizabeth of Russia endorsed his petition to establish the university in Moscow. The church of Saint Tatiana was later built in the university campus, and the Russian Orthodox Church declared Saint Tatiana the patron saint of students, and Tatiana Day has become celebrated as Russian Students Day. 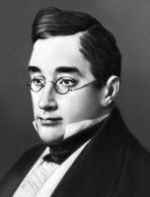 Alexander Herzen - major Russian pro-Western writer and thinker known as the "father of Russian socialism." 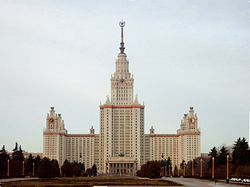 History of "Moscow State University"
This page was last modified on 23 October 2018, at 23:36.